CASTE tensions are simmering in Maharashtra, where in the past 12 months alone there have been seven caste-related murders. The seemingly low figure is significant because the seven people lost their lives only because of the lower social status ascribed to them by birth. And the State revels in calling itself progressive and modern. The murders were of a gruesome nature; it was as if some vengeance was being exacted. Only some of these cases have been registered under the Scheduled Castes and Scheduled Tribes (Prevention of Atrocities) Act, though on the face of it there are adequate pointers to a caste angle to all of them. Analysis of National Crime Records Bureau (NCRB) data for crimes against Scheduled Castes under the Prevention of Atrocities Act from 2001 to 2012 shows that Maharashtra had 3,210 reported cases of atrocities in this period. The State was ninth on the list, which Uttar Pradesh topped with 26,378 cases followed by Tamil Nadu with 10,845. Priyadarshi Telang of Manuski, an organisation that campaigns for social justice, says Maharashtra has an annual conviction rate of less than 3 per cent and thus holds the State “responsible for the increasing caste atrocities in Maharashtra”. The latest case, the murder of a young Dalit man in Shirdi, highlights the growing trend of violence against Dalits in Maharashtra. On May 16, nursing student Sagar Shejwal was murdered and his body mutilated. The reason for this brutality was something as innocuous as his cell phone ringtone, “Kara kitihi halla, majboot Bhimacha killa” (Raise your voice all you want, Bhim’s fort remains strong). It is a song of strength for Dalits, a rallying cry with its references to solidarity and community togetherness and the leadership of B.R. Ambedkar. The higher castes perceive it as defiance, especially if they nurture resentment towards Dalits. This is what seems to have happened in Shirdi. Sagar had come home to Shirdi to attend a wedding. On May 16, he and two cousins went to a local beer bar. At some point, his phone rang and this apparently annoyed some men in the bar. Recounting the story later, his brother Akash said a man came up to Sagar and asked for his name. When he replied, he asked Sagar to switch off his phone. Sagar refused, saying it caused no one any problem. That innocuous statement, combined with his obviously Dalit surname, was enough for the man and his eight friends to attack Sagar and his cousins with beer bottles. Akash said the bar owner called the police who apparently replied they had no vehicle to come to the site. Akash pointed out that that the police station was just two minutes’ walk away. Significantly, the fight was captured by the bar’s security camera. This played a big part in the six arrests that have taken place so far. But what happened outside the shop was far worse and for this there are no witnesses. Once he was dumped on the bike, Sagar was taken to a wooded area, where his body was later found stripped of clothes and with multiple fractures and telltale marks of a two-wheeler having been driven over him. The autopsy report said he died of multiple fractures. The six men have been booked, among other things, for murder and offences under the Scheduled Castes and Scheduled Tribes (Prevention of Atrocities) Act. Sagar’s assailants belong to the Maratha caste and Other Backward Classes (OBC). The other six murders too highlight some commonalities. All of them were caste-specific. In all the reported cases, the aggressors were either from the Maratha community or from the OBCs, people belonging to communities just one level higher than Dalits in the caste hierarchy. Explaining this surprising lack of empathy for their kindred folk, Paul Divakar of the National Campaign on Dalit Human Rights says that those communities which were not traditionally “upper caste”, have now risen economically and are part of the power structure. Marathas, for instance, are new entrants to a higher social standing. Keen to maintain this, they ally themselves with the upper castes and prove their allegiance by stomping on the traditional underdog, Dalits. Some of the fatal crimes against Dalits in the past 12 months are listed below. On April 3, 2014, a former sarpanch named Ganesh Chavan in Jalna district assaulted a Dalit called Manoj Kasab. The reason: Kasab became sarpanch thanks to reservation and Chavan was offended that he had been “usurped” by a Dalit. Kasab’s assailant was a Maratha and he was booked under the Prevention of Atrocities Act along with 10 others who had helped Chavan. 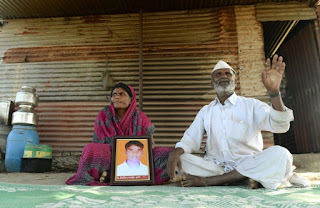 On April 25, 2014, Umesh Agale was stabbed to death in a village in Aurangabad district. He was suspected of having an affair with an upper-caste girl. Three Maratha men lured Agale out of his house on the pretext of talking to him, killed him in the adjoining fields and dumped his body in a well. There was initial resistance to treating this as a caste atrocity case, but the police later registered it as such and booked the three men. Three days later, on April 28, a teenaged Dalit boy was strangled to death and his body was hung from a tree in Ahmednagar district because he spoke to a Maratha girl. The boy, Nitin Aghe, was taken from his school by the girl’s brother and another man, beaten and then strangled. Initial investigations did not even treat the death as murder, let alone a caste crime, but later this was reversed and a case was registered under the Prevention of Atrocities Act. On May 1, 2014, Manik Udage was crushed to death in a stone quarry by four Maratha men from his own village in Pune district because they objected to the celebrations Udage had planned for Ambedkar Jayanti. It took a year for the police to register a case under the Prevention of Atrocities Act. A fortnight later, on May 16, Sanjay Khobragade, a Dalit activist in his forties, was set on fire in Gondia district. He was trying to prevent a higher-caste family from usurping land set aside for a Buddha vihar. Despite 90 per cent burns, Khobragade managed to give a dying declaration to the police implicating six people of a Powar family. They were charged under the Prevention of Atrocities Act but were set free when a new angle was “discovered”, in which the victim’s wife was apparently engaged in a liaison with someone else. October 21, 2014, saw three of a family butchered in caste violence in Ahmednagar district. Sanjay Jadhav, his wife, Jayshree, and their son Sunil were murdered in the early hours of the day. When farm labourers told Sanjay Jadhav’s brother they had not turned up for work, a search was initiated. The mutilated bodies of the men were found strewn around in a farm. The woman’s body was found with a deep injury on the head. The cause of this violence was attributed to an alleged alliance between Sunil and an upper-caste girl. No immediate arrests were made, but later the very man who had filed the first information report (FIR) was arrested. He was the deceased man’s nephew and the police maintain that the reason for the crime was a family dispute. Once this arrest was made, the charge of “family dispute” safely took the case out of the realm of the Prevention of Atrocities Act. Nothing more was heard about the initial claim that there was an alliance between Sunil and an upper-caste girl. On January 1, 2013, Ahmednagar district saw the murder of three Dalit men who worked as safai kamgars (cleaners). Sandip Dhanwar, Sachin Dharu and Rahul Kandare were called one morning to clean a septic tank at the house of Prakash Darandale, a Maratha. At 8 p.m., a relative of Dhanwar received a call from the police saying he had drowned in the septic tank. Knowing two other people had accompanied Dhanwar, the relative asked the caller about their whereabouts. He was told they had already left. A few hours later, he received another call from the police informing him that the other two were found dead in a well. The bodies of these two were mutilated, with Dharu’s head and limbs severed from the body. Cases under the Prevention of Atrocities Act were registered and the police said that it was related to honour killing because of some involvement with an upper-caste girl. These cases are just the reported ones. There are many that have not ended fatally and many remain unreported because of the tedium of the legal process as well as dominant caste arrogance that deters people from pursuing justice. Dr V.A. Ramesh Nathan, general secretary of the National Dalit Movement for Justice, says that at the national level conviction takes place in fewer than 10 per cent of the cases under the Prevention of Atrocities Act. Compare this with the 44 per cent conviction rate for cases filed under the Indian Penal Code (IPC). He attributes the low percentage of convictions to poor investigation and implementation of the law. In almost all cases, counter-cases are filed and the victim or their family is forced to withdraw their original case. In the special courts there is a nexus [between the authorities]. They do things like not filing the charge sheet on time. If the Prevention of Atrocities Act is to be seen as the deterrent it is meant to be, then cases need to be resolved with some speed. While constitutional and legal means of justice exist for Dalits, their implementation is sluggish. For many this is as good as no law.